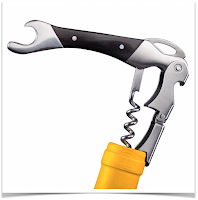 Wino 4 Life: Wine Tip of the Week - There's an App for That! Hello Vino (Free). Wine recommendations, image recognition of wine labels, huge database of wine - good stuff! I have used this app for a while now, but haven't tried the label image recognition. There is an extra cost for this - I just bought 20 label recognition for 99 cents, and will let you know how it works for me. WineDJ (Free). Have you wine & food pairing figured out - how about suggestions for music? Cor.kz ($1.99). If you use Cellartracker to keep track of your wine stash - this App integrates with it for easy access to what you have on hand. WineSpectator WineRatings+ (Free - Sort of). For perhaps the ultimate listing of wine ratings and reviews - there is this WineSpectator App. While free to get the App, access to the database of wine reviews comes at an extra cost of $2.99 per month - but for that cost you get updates of more than 1,000 new reviews each month. I personally subscribe to Wine Spectators e-Magazine and their website, but am considering switching to this service. Suggestions on other good apps? Share them with us in comments below! WineDJ is such a clever and fun idea, it is interesting the kind of music it selects.